They feel confident that they will achieve their goals. Almost all of the young investors surveyed (89%) feel somewhat to very confident that they will save enough to enjoy their retirement. But early withdrawals are increasingly the norm. Almost sixty percent (59%) of young investors stated they had made an early withdrawal from their retirement account. 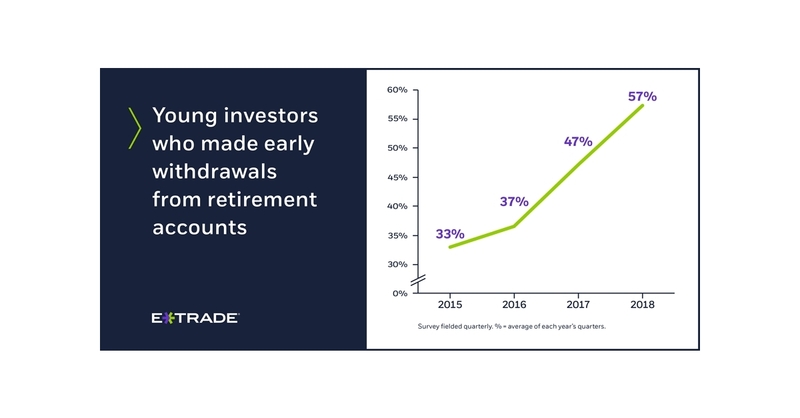 In fact, early withdrawals among young investors rose significantly over the past three years—from roughly one out of three, to now more than half. They don’t think they need much. Young investors are most likely to think they’ll only need between $250,000 and $999,999 for a successful retirement. Boomer investors tend to disagree, skewing toward recommending between $1 million and $2 million for a successful retirement. Start saving. The earlier, the better. Saving steadily over a period of time can help your nest egg grow. So, don’t wait to start contributing to your employer’s retirement plan. The power of compounding interest is a huge benefit for young investors working toward retirement goals. Even for investors who may be getting a late start, every little bit helps. Look, but don’t touch. First, consider setting up automatic contributions. It removes the guesswork from deciding how much to invest each period. Also, it’s important to keep an eye on your portfolio and be strategic about your asset allocation. Since you’re investing for the long term, there will be market fluctuations, but it’s important to remember that attempting to time the market is a futile exercise and withdrawing from your retirement portfolio early can come with serious penalties. Don’t leave money on the table. If your employer offers a contribution match to your 401(k), this is as close to free money as one will ever come by in the investing world. It is probably the easiest way to seriously kick-start long-term investing. Those with IRAs should consider contributing the annual maximum ($5,500 for those under age 50 and $6,500 for those 50 or over) to make the most of these tax-advantaged accounts. This wave of the survey was conducted from July 1 to July 11 of 2018 among an online US sample of 940 self-directed active investors with a sample of 284 young investors between the ages of 18 and 34 who manage at least $10,000 in an online brokerage account. The survey has a margin of error of ±3.20 percent at the 95 percent confidence level. It was fielded and administered by Research Now. The panel is broken into thirds of active (trade more than once a week), swing (trade less than once a week but more than once a month), and passive (trade less than once a month). The panel is 60% male and 40% female, with an even distribution across online brokerages, geographic regions, and age bands. If you could take one finance class, which would you take? Have you ever taken out money from an IRA or 401(k) before the age of 59.5 and, if so, for what? How much money do you think you'll need for a successful retirement? What percent of your salary are you currently allocating to a retirement account? How much money do you recommend that your friends and family put aside from their monthly paycheck for retirement? How confident are you that you are currently saving enough to enjoy the retirement that you want? Automatic Investment Plans and dollar-cost averaging do not ensure a profit or protect against loss in declining markets. Investors should consider their financial ability to continue their purchases through periods of low price levels.